For the past three weeks, the Chicago Department of Transportation has been executing a re-pavement project in both the northbound and southbound lanes of Lake Shore Drive between North and Grand Avenues. The lanes have been completely stripped and re-paved during both overnight and daytime non-rush hours. CDOT has announced that next week there will be full overnight closures at the Oak Street “S” Curve. In the past three weeks, there have been no full overnight closures as anticipated, though the upcoming closures are required for the final phase of the project. Monday (11/09/15) – Northbound Closures – 8:15 p.m. and 5:45 a.m.
Tuesday (11/10/15) – Northbound Closures – 8:15 p.m. and 5:45 a.m.
Due to high winds and rain, the final two days of the closures, affecting the Southbound lanes, have been postponed. Wednesday (11/11/15) – Southbound Closures – 8:15 p.m. and 5:45 a.m.
Thursday (11/12/15) – Southbound Closures – 8:15 p.m. and 5:45 a.m.
Sunday (11/15/15) – 8:15 p.m. to 5:45 a.m.
Monday (11/16/15 )- 8:15 p.m. to 5:45 a.m.
All Northbound traffic will be detoured off Lake Shore Drive at Randolph then travels westbound to Michigan Ave., and back onto northbound Lake Shore Drive where Michigan Avenue ends at Oak Street. All of the ramps from Randolph St., Wacker Dr. and Grand Ave. to northbound Lake Shore Drive will be closed with local access only at the Grand Ave. ramp. During this time, southbound Lake Shore Drive will remain open. Updated with new dates: The closures will be the same for the Southbound lanes [on Sunday, November 15th and Monday, November 16th] as traffic will be detoured off at Michigan Avenue, heading south. The Chicago Ave. access will still be in service, though the official detour route is south on Michigan to Randolph and east on Randolph back to Southbound Lake Shore Drive. 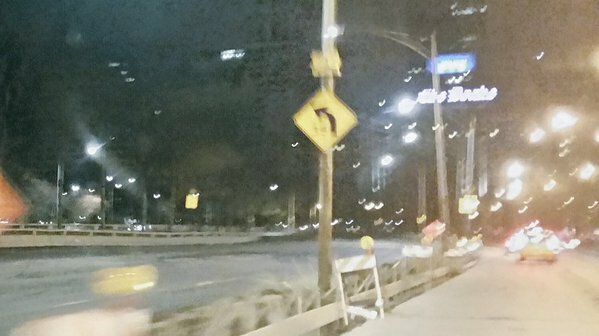 Lake Shore Drive southbound “S” Curve at Oak Street. According to CDOT, this segment of Lake Shore Drive handles a daily average of 140,000 motorists per day in both directions, and approximately half that volume in each direction. The traffic volume is reduced during the overnight hours to between 12,000 and 13,500 vehicles in each direction. CDOT also states that there will be periodic lane closures throughout the non-rush times on these days for other types of work that can not be completed overnight. These projects will close no more than one lane at a time between the hours of 9:30 a.m. and 3:30 p.m. Monday through Thursday. It is recommended that motorists utilize the Kennedy expressway as an alternate during the overnight hours when the “S” Curve is planned to be closed.